The minister of water affairs and sanitation, Mr Gugile Nkwinti and Nestlé Mossel Bay manager Chris Ngwendu and the Swiss Ambassador, Helene Budlinger Artieda. The newly installed infrastructure will enable the factory to reuse and recycle water from its dairy operations. Nestlé South Africa in Mossel Bay has today become the Swiss multinational’s latest regional business to transform its dairy factory into a “zero-water” manufacturing site, Mossel Bay Advertiser reports. 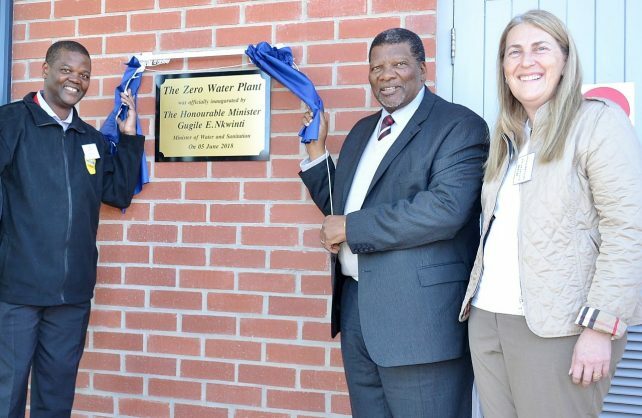 The new facility was officially inaugurated by Minister of Water and Sanitation Gugile Nkwinti, accompanied by the Swiss Ambassador to South Africa, Helene Budlinger Artieda, the executive mayor of Mossel Bay, Alderman Harry Levendal and the Mossel Bay manager Chris Ngwendu. Over the past six years, the company has installed new water recovery, treatment and recycling technology at its Mossel Bay dairy factory, which is located in one of the Western Cape’s most water stressed regions. This newly installed infrastructure will enable the factory to reuse and recycle water from its dairy operations. The Nestlé Mossel Bay factory produces milk products such as Nespray, Nido, KLIM, Condensed and culinary milks.